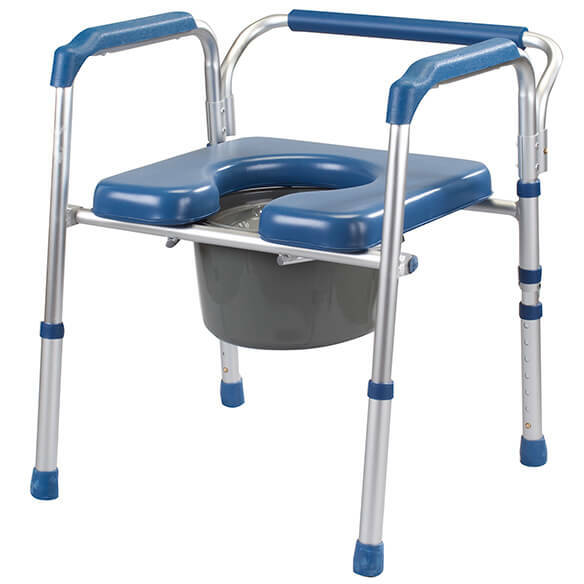 Versatile, 4-in-1 commode with padded seat eases daily living for anyone with limited mobility. 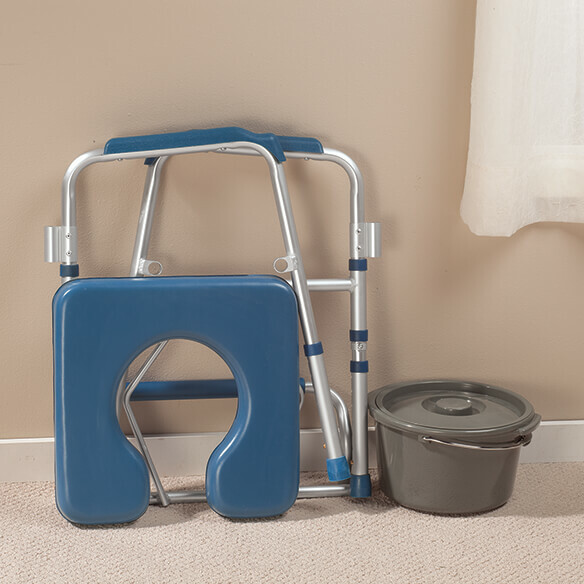 In addition to serving as a bedside commode or shower chair, the portable commode frame fits around an existing toilet for added support, with or without the removable 2" thick padded seat. No Express Shipping. Bucket can be used with liners for easy cleanup. Lightweight aluminum frame supports up to 265 lbs. Folds to 3 1/2"W for easy storage. 21 1/2"W x 23"D unfolded. Telescoping legs adjust overall height from 24 1/2"–30"H.
16 1/2"W x 16"D seat adjusts from 17"–23 1/2"H.
because it is lightweight aluminum frame can supports up to 265 lbs. It looks very comfortable. The square backing and color is acceptable to the eye. mother needs a higher and safer toilet seat. She has fallen off the riser without rails. convenience for my husband and it looks very stable. Will let you know more after we receive and use item. Thank you. comfort and sturdy also folding. My mother is 90 year-old and she does not has bathroom in her bedroom. So I believe that this is going to be very helpful for her. 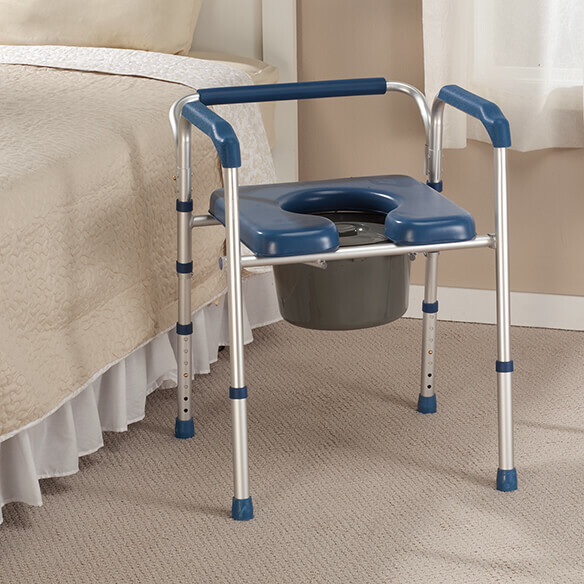 Occasionally back problems make it difficult to get on or off of the toilet and we may some day need a bedside commode. 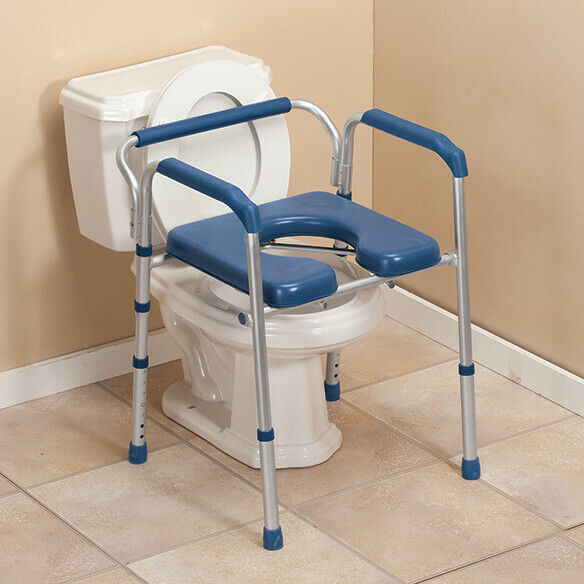 is the splash guard on the commode for use while using over the existing toilet? Does this see her reverse so that I could have you opening facing the back? can back rest be removed when used in shower? Is the bucket removable when using on regular toilet? BEST ANSWER: Thank you for your question. Yes the bucket is removable. We hope this information will be of help to you. Yes, I use the seat for showering so never use the bucket in order to have access to the private areas with out standing. BEST ANSWER: Thank you for your question. We have a 45 days return policy. You will be responsible for return shipping if you are not happy with it. We hope this information will be of help to you. BEST ANSWER: Thank you for your question. The seat is 16 ½"Wx16"D. We hope this information will be of help to you. is the soft seat used in the shower ? BEST ANSWER: yes it is - that is the primary reason for purchasing this chair - didn't need it for the toilet aspect - needed in the shower to be able to sit while getting clean. Thank you! Going to get one.